Provide comfort for the family of Daouda Toure with a meaningful gesture of sympathy. 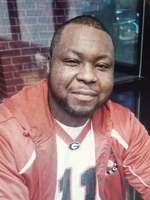 Daouda “Dee” David Jones Toure was born in Guinea-Conakry on June 17, 1982, to Amadou Toure and Mariama Soumah, and passed away at the age of 36 on January 3rd, 2019 at his home in Springville, Utah. Sadly, at the age of 2, Daouda contracted Polio, and in an effort to save his son’s life, Amadou Toure gave Daouda up for adoption to a wonderful and selfless Foreign Service Officer, Mary Roberta Jones. A few months later, Dee’s sister, Fatoumata Toure, joined the family that later became known as the three Musketeers by their family friends. Daouda and his sister were blessed to have lived in Guinea, Ghana and Cameron as their mom got assigned to different countries. Summers were spent in Paris, France, Washington DC and Rhode Island. Daouda especially liked the summer spent on a ranch in Billings, Montana, where he excelled in horse back riding and visited Yellowstone park with the other Musketeers. Daouda’s life was rich and full of adventure. If you ever got a chance to talk with him, he would fill you in with vivid life stories accompanied with lots of laughter. Dee was a historical and political intellect and an actor, as he enjoyed theater and plays, such as Macbeth, Les Miserables and A Summer’s Night, frequenting the Shakespeare theater and the Kennedy Center. Lots of knowledge flowed in his beautiful head. Fast forward a good few years, Dee is in Provo Utah, living with his now ex-wife Sarah Roylance, before permanently settling in Springville, Utah, while he held down a few jobs. Dee settled down with his then wife Sarah who bore him three healthy and exceptionally good looking children, Fatima Rose Josephine, his princess as he always called her; and his two princes, Rodney “Booboo” Toure, and Keenan “Baby baba” (Lil cookie monster) Ahmed Toure. Daouda was a truly handsome, wholehearted and supportive little brother who had a fear of elevators and planes. He once took a three day train ride to come and be by my side as I worked through a rough patch in my life. Daouda will be terribly missed by his kids, his sister, his entire extended family and friends. He is preceded in death by his adoptive mom and his biological mother. He is survived by his three children, his sister, his father who is in Africa and many other siblings. To send flowers in memory of Daouda Toure, please visit our Heartfelt Sympathies Store. We encourage you to share your most beloved memories of Daouda here, so that the family and other loved ones can always see it. You can upload cherished photographs, or share your favorite stories, and can even comment on those shared by others. Provide comfort for the family of Daouda Toure by sending flowers.